Local residents and visitors are invited to the American Cancer Society’s Real Men Wear Pink Making Strides Against Breast Cancer Happy Hour for Hope, which will be held at Taberna Tapas & Wine Bar at the Brick Walk Promenade in Fairfield, on Tuesday, Oct. 25, from 5:30-7:30 p.m.
Attendees are asked to wear something pink, to this festive party — there will be prizes for the “pinkest” man, woman, and couple. There also will be a drawing, for gift certificates from local businesses, including several gift certificates for dinner at Taberna. Additionally, there will be a hot pink Maserati, from Maserati of Westport, that will be parked in front of Taberna during this Happy Hour. This distinctive automobile is used to support the national campaign to raise breast cancer awareness. Guest bartenders, at this event, will be Real Men Wear Pink Fairfield candidates Joseph Barbetta, Michael Burdo, Esq., Steven D’Amico, and Robert Kalina. Special guests include Fairfield First Selectman Michael Tetreau and Selectman Christopher Tymniak. The donation, of $20, per person, includes one drink and a selection of Spanish tapas, from Taberna chef/owner Daniel Lopez. Admission is free for all cancer survivors. These prominent local men are taking a stand, against breast cancer, to support the American Cancer Society’s Real Men Wear Pink Campaign. 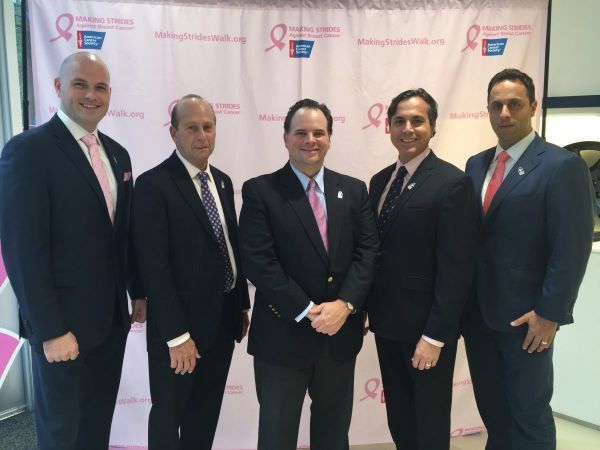 In its inaugural year, in Fairfield County, these gentlemen are wearing pink, throughout the month of October, and are competing to be the top fundraiser by the end of the Making Strides Against Breast Cancer campaign. Joseph Barbetta – This Fairfield native is a Retirement Planning Specialist with The Connecticut Group in Stamford. Michael Burdo – This Fairfield attorney is a partner in the law firm of Bansley, Anthony, Burdo, LLC. Steven D’Amico – This Fairfield resident is the Vice President of the Forte, Mason, D’Amico Group, a wealth management firm in Westport. Robert Kalina – This Fairfield resident is the Vice President of Human Resources with the Financial Accounting Foundation. Dr. Mark Melendez- This plastic and reconstructive surgeon has offices in Fairfield and Shelton — Cosmetic & Reconstructive Surgery Associates of Connecticut. Since 1993, over 12 million people have raised over $750 million by participating in The Making Strides Against Breast Cancer campaign. The money, that is raised, has helped the American Cancer Society to ensure that no one faces breast cancer alone, by funding innovative breast cancer research; promoting education and risk reduction strategies; and providing patient support. For additional information, on ACS, please phone800.227.2345. Taberna Tapas & Wine Bar is located at the Brick Walk Promenade, at 1229 Post Road, in Fairfield. Phone 475-999-8585, tabernarestaurant-ct.com. RSVP for the Happy Hour for Hope at Taberna on October 25, 2016, to John Brannelly at the American Cancer Society by phoning 203-563-1519 or email John.Brannelly@cancer.org.